I like observing people for nothing more than the simple pleasure of capturing humanity. My favorite place for ‘people watching’ is at Starbucks. As I stand in line, I am amazed at the sea of visible faces from another place. Most people are immigrants, and I wonder why and how they got here. My story takes place in Nicaragua, November 09, 1986. “This is the last call for flight Copa 1327 destination to Los Angeles,” I heard the loud voice say through the speakers, as I boarded the plane to my new life. I never walked a hallway as long as the one leading up to the door of the plane. Every step felt eternal. It was surreal. If leaving my homeland was not enough, I was also leaving my family behind. I was the only one who had been able to obtain a visa for the United States. Flashbacks began to pour in. “Que Viva Nicaragua Libre!” were the shouts that came from the hearts of millions of Nicaraguans who crowded the streets, celebrating the revolutionary victory on July 19, 1979. I still remember the massive uprising against the corrupt and repressive dictatorship of Somoza which had dominated my country for over four decades. For us, Nicaraguans, the revolutionary victory of the Frente Sandinista de Liberacíon Nacional (FSLN) raised the possibility and hope that for the first time in our history we would be free from repression. Sadly, here I was six years later boarding a plane feeling heartbroken and scared. I was heading to what for me was a new and unknown life. The government that we had helped bring to power, the one that promised economic and political reforms, freedom from repression and political stability, had failed us. My beautiful Nicaragua is located in Central America between the Pacific Ocean and the Caribbean Sea. Nicaragua is blessed with dramatic terrain of lakes, hundreds of volcanoes, a rainy and dry season, delicious food, colonial style towns and beautiful beaches. It is a country devoted to religious values and made up mostly of Indians and mestizos, (people of mixed European and Indian ancestry) who love their land and are willing to die for the freedom of their country. “Would you like some coffee, tea or water?” asked the flight attendant. I stared at her. I couldn’t even answer. I didn’t know what had hit me. I was overwhelmed with different emotions and fear. I just sat there in my seat in silence replaying my life for the last 16 years. I was faced with the sad reality that the Nicaragua I was born into no longer existed. The one I was leaving was destroyed and the memories that marked my childhood were ashes, war, blood, and famine. For those of you who have escaped from war-torn countries, you know what it feels like. For those of you fortunate enough to have never lived through a war, be grateful. As I reclined my head on the seat of the plane, I closed my eyes, tears caressing my cheeks, the sound of emergency sirens lingered in my ears. The thundering force of exploding bombs were still echoing in my soul. I could still feel the coldness of the red clay floor in my hands as I made my way to hide under my bed as the bullets were flying through. I was told that the thickness of the mattress and the box spring made with metal coils held in place by thick wires would help protect me in the event a bullet fell directly on me. Facing down on the cold floor, I could hear the shouts of people coming from outside as my bedroom wall paralleled the streets, “Patria libre o morir” (free land or die). I was terrified, not knowing if we would live or die. The men in our family had been recruited to fight and we were left alone to fend for ourselves. As I sat comfortably on the plane, adjusting my seat belt and seeing everyone come in to take their seats, the memories were flooding in. The aftermath of a war is devastating. I feared not seeing my dad again. Since my dad was a doctor, he had been gone for days staying at the hospital tending to the thousands of wounded civilians. An epidemic spread over the nation as thousands of corpses began to decompose, and the water supply became contaminated. Health services were in chaos, medical supplies also ran out. I can only imagine my father’s anguish, torn between his vocational duty to help save human lives and his family, unprotected and alone. The flight attendant handed me a menu. “Would you like the omelet or the healthy option of fruit?” She asked. I almost felt guilty and did not take any food. I felt bad for those I was leaving behind. The food supply had run out all over the nation. In Managua alone, one hundred thousand people lined up each day, to receive food. Another six hundred thousand hungry people received no relief at all. In other cities, the situation was even worse. To manage the shortage of food and supplies, the government nationalized all the supermarkets and commerce. The government controlled it all and rationed our food. My family was given a ration card to present to a designated store where we were given a bi-weekly allowance of half a case of eggs, one roll of toilet paper, half a pound of dark sugar, half a bar of soap, half a pound of rice per person. Often there was not much to eat. Money became a commodity that was no longer valued as you couldn’t even use it because there was nothing to buy. People entered a barter stage system. I remember patients coming to see my dad at the clinic carrying chickens and eggs. In exchange, he would supply them with medical services. Yet, it is amazing what the human spirit can do in order to survive. They say that God always provides no matter what, and indeed, He did. As in the case of my ancestors, manna from heaven fell to feed the Jews in the Egyptian desert, our manna came from our beautiful oceans and the birds from the sky. When the war broke out we were in Corinto and surrounded by the ocean, my family obtained fresh fish to eat and when that also became difficult to obtain, my mother and I became resourceful. I remember our backyard was visited by pigeons. We were hungry and we also had my two baby brothers to feed and protect. I gathered grains of rice, a wood stick, a string of nylon and a carbon box and with it, made perfect traps. I tied the string to the stick and put the box on an angle, suspended by the stick, half open, facing down, and the grains of rice inside, opened enough for the pigeons to see the rice and get inside to eat it. I held the long string far enough and hid so the pigeons would not see me. Once they were inside eating the rice, I would pull on the string and the box would collapse down holding our nutritious protein that my mother would make into a soup to sustains us through the war. I like to tell my children this story when they complain of not liking anything from the many choices we have at dinner time, I remind them of this. They cannot believe it and make a face of disgust for what I had to eat. Once I put things in perspective, they began to enjoy the food they are so fortunate to have. There was destruction everywhere. The bombs destroyed much of the residential, commercial and industrial property in Nicaragua. Among that lost was my home, burnt to the ashes. Yes, my family and I lost everything we had. A crater marked the place where my home once was. The day before the war broke, I had left the city of Leon where I lived at the time, and had gone to visit my grandma who lived in the port of Corinto. Had my family and I stayed in Leon, we along with the many other families in our old neighborhood would have died. It was a miracle! Who would have known, that a visit to my grandma was meant to spare our lives and for a greater purpose I am sure! This may seem like a scene from a Hollywood movie perhaps, but it was a reality for us Nicaraguans. In the years after the insurrection, I witnessed my country endure more betrayal, more repression and more corruption than previously experienced under the Somoza regime. In spite of what we had hoped for at the time of the revolution, nothing changed. Our Nicaragua became a magnified mirror of the atrocities of its predecessors. My poor Nicaragua hardly stood a chance of recovery. How could we? A massive exodus in our country took place. The capitalist elite, the terratenientes — the owners of land and all major industries, the doers, the entrepreneur power of my country left. We were now being governed by monkeys, by corruptive thieves, disguised as liberators who possessed no experience or expertise in how to reconstruct the economy of an already damaged and oppressed country. “Would you like a headset to watch the feature film?” Asked the flight attendant. I politely declined. No need, I thought. I was already running a full feature film in my head, except this was a documentary and it was up close and personal. What a disappointment, I thought. How could we have been so blind, so wrong and for so long? 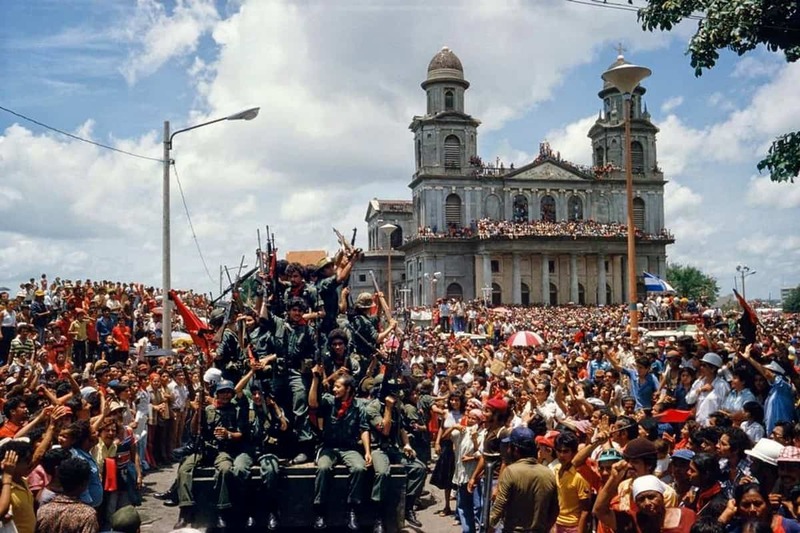 After the revolution, Nicaraguans had hoped to establish a Liberal Democracy, but by 1983, it became clear that the Sandinista movement betrayed the population by changing their objectives. At the helm was their newly appointed leader, Daniel Ortega, a communist, authoritative and repressive ideology was imposed. To retain the support they had gained at the time of insurrection among the population, the Ortega government acted under the false pretense of a Marxist ideology. Ortega should be ashamed! There was nothing Marxist in Ortega’s mind. Instead of an egalitarian, collectivist and participatory society, Ortega created an authoritarian government that sacrifices and sheds the blood of its innocent people and stops at nothing for his own personal gain and empowerment. This remains true to this day! About a month ago, as millions of Canadians made their way to vote in a real, free election, I walked towards the booth with my vote in hand, having a feeling of pride. Maybe a feeling others born to the US or Canada may take for granted, I don’t know. For me, it was an inner knowing that this time, the vote I had earned by becoming a citizen of this free world, a vote that many fought for the right to have, was going to actually make a difference in the direction of my new country. A huge difference from the last time I stood in line to vote in Nicaragua. Suddenly I was jolted back to reality by an abrupt tremor. I was terrified when I heard the captain, “Ladies and gentlemen we are entering an area of turbulence. Please fasten your seat belts and refrain from using the lavatories at this time.” I was scared, having never experienced being on a plane before. I was new to this thing called turbulence. Was I going to die on my way to freedom? Will I ever see my parents and brothers again? I wondered. In response to the pressures of the contra-revolution, in 1983, the FSLN implemented a universal military service for males eighteen to twenty-five. However, in order to increase the size and strength of the military, the Ortega regime began to illegally recruit males as young as sixteen and as old as fifty. A year later, the government began to integrate women and by 1985 women comprised 45 percent of the militia. Anyone who could see through the hypocrisy of this government started to find a way to leave the country. The military service policy caused a second exodus in Nicaragua as thousands of middle-class families who were lucky to find a way to leave to avoid this policy left. Seeing that many were leaving the country, the Ortega regime implemented strict rules for anyone wanting to leave. All access was denied because the Ortega government needed bodies to fight a war that was no longer ours and to defend a government we no longer supported or recognized. Today, the wrath of Ortega’s madness falls strongest against the student population, which had previously been the FSLN’s biggest supporters. As I write this almost forty years later, Ortega has gone on a killing-spree against university students who have risen up once again to fight against this brutal dictator. My Nicaragua became a carbon copy of the Cuban and Russian models — repressive, controlling and unaccountable. This marked the beginning of a highly paranoid and repressive model that felt the need to monitor the lives of its citizens. Everything and everyone was watched. Night time curfews were implemented. If you were found on the streets past the curfew you were sure to suffer the consequences. We were driving one night past the recommended time. My dad and my mom were at the front and I was sleeping in the back seat when a bomb was thrown on the road close enough to shatter all the windows of our car, but far enough to spare our lives — AGAIN! – For a greater purpose, I am sure. There was no freedom of speech or movement. People in each neighborhood were tasked with taking turns at different hours of the night to watch and monitor everyone. The ones like my family who refused to participate were labeled anti-Sandinistas. A new breed surged in our society referred to as ‘Orejas’ which means ‘ears’. They served the state as spies and the government would reward anyone with information or suspicion of opposition. A mutual mistrust amongst Nicaraguans swept the nation. Our lives were constantly threatened by anonymous letters, crank-calls and acts of violence such as when we came home one night to find our cat, dead, hanging on the ceiling by the front door. The simple pursuit of personal safety didn’t exist. Going out with my friends at night, as many do in this country, was something I ended up fearing. In my teens, it was not unusual to see your friends one day and never see them again. I remember coming out from the cinema one night and seeing military trucks parked on the side of the road, taking young boys against their will. As I write this, I think of my handsome nephew, Hudson, born here, who is about that age who will, thank God, never know the fear I saw on those boys’ faces on those trucks. I imagine what it would have been like to give a sixteen-year-old boy an automatic rifle. Would he make it home alive? I wondered. Many people I knew who were suspected of being anti-government ended up in Managua’s notorious ‘El Chipote’ prison. They were placed in tiny, stifling, lice-infested cells with steel doors, no light and with only a hole in the ceiling to let in air. People close to our family were tortured, deprived of food and water and raped. Their nails were pulled out and had to withstand electric shocks as a form of interrogation. My uncle, Alfredo Hinckel who was outspoken about the atrocities of the new regime was assassinated in his home in the presence of his wife and kids. A horrible experience for our family. Another flashback hit me. As I returned home from school I found my mother crying and many people talking to my dad. “What happened?,” I asked. My three younger brothers had been kidnapped. Two days later, they were found on the side of a country road. They had been taken and kept blindfolded, interrogated about my father’s alleged anti-government activities. They were five, six and nine years old! Sounds like a Netflix movie don’t you think? A reality for me! After being separated from my family for eight months, I am happy to tell you that my father with my three brothers and mother managed, at a great risk, to escape. God works in miraculous ways. My father had been invited to attend a medical convention in Guatemala for cardiology and asked the Ortega government for permission to attend. He was granted a two-week pass and was escorted to the plane. What the government didn’t know is that my mother and brothers had boarded an earlier flight. Once they met in the Guatemalan airport, they proceeded to take a flight to Miami where we all met, embraced and after many happy tears, boarded the plane to what was to become our new land. I looked through my window and there it was, a sea of lights below. “Please prepare for landing, the local time in Toronto is 11:20 pm and the temperature is 20 degrees celsius. We should be landing in the next 15 minutes,” announced the captain. I had never been more anxious than at that moment. Here we were, coming to a new land, having escaped from the only home we knew, with nothing but a dream — to start over again. By this time my ears began to buzz and I could feel the wheels of the plane unlocking underneath in preparation for landing. Standing still on the runway for a few moments, I tried to abandon the movie I had been replaying in my mind and tried to focus on what was about to take place. Upon landing at Toronto Pearson International Airport, my family was escorted to a private room where we were told we had violated the laws of this country by illegally entering Canada without a visa. I was exhausted. My parents and I did not speak much English, but you do not need to understand the language to perceive that the officers were displeased with our presence. I heard the word of what sounded similar to the Spanish word, deportación. “No, no, we can’t go back,” I heard my father plead to the officer in his broken English. As soon as an interpreter came, my father continued his plea, “We are claiming political asylum under the Refugee Act. My life and the life of my children are in danger.” He kept repeating. Yes, my dad was correct. We could not be sent back — that was no longer our home and the more time we stayed, the less of a chance we had of survival. This was the case for many Nicaraguans. The smart ones left right of way after the Somoza government was overthrown. The ones like us who stayed, the ones who believed in the chances of reform, ended up paying the price. Many, like us, have left Nicaragua and everything behind. Today there are a few million Nicaraguans in exile, but many more of my people are still there, fighting and shedding blood in the hopes for a better tomorrow. Many more are still enduring the atrocities of a government that governs itself without checks and balances, without repercussions or morality. We have a government that has blood on their hands and one that has become deaf to the cries of mothers who are losing their sons and daughters for the cause of freedom. It has been now over 30 years for me and my family since we left our beloved Nicaragua. I am grateful. I was one of the fortunate ones. I am now part of this incredible mosaic country I am proud to call home — Canada. Starting a life in Canada was not easy. The first three years were trying, without money, connections, friends or language. Living off food stamps, at the mercy of many wonderful organizations in Toronto such as the Scott Mission, our family was able to have food to eat. Our clothing came from the chic Goodwill and Salvation Army second-hand stores. Yes, we started in Canada with very little, but we had our freedom. Thanks to the generosity of this government that gave us money and a roof for the first few years so we could go to school and learn English, we were able to slowly carve a new life for ourselves. Sometimes late at night when my daughters are asleep, I walk through the halls of my quiet home and I am overtaken with a huge sense of pride, joy and gratitude. I have a beautiful place to call home. As I lie in my comfortable and beautiful bed, I am reminiscent of how far I have truly come. Arriving here and living in a rental attic with no air conditioning, sleeping on the floor, on a mattress that we had found in the garbage behind a building nearby. Yes, sometimes someone else’s garbage becomes someone else’s treasure. I have worked hard every day of my life since. I put myself through university. I was fortunate enough to have founded two great companies and have two amazing girls that are my driving force. Today, decades later, I can say that my sacrifice has paid off. My children, like everyone else in North America, enjoy the privilege to have been born in a free country. They enjoy the freedom to speak their minds without fear of repression. They can play outside without curfew and feel safe to walk the streets. My children can pursue their dreams without limitations. They enjoy an education that is unbiased, unlike the one I had in Nicaragua. There is always some good that can be derived even from the most horrific of circumstances. My journey here has taught me to be more grateful and appreciate all the things my children may take for granted. It’s not their fault. They don’t have anything else to compare to. But I tell my girls my story, not so that they can pity or admire their mother, but so they understand how fortunate they are. I want them to learn to be grateful for what they have and proud of the country they live in. I tell them my story so that they can appreciate the food we enjoy each day and the safety they have when they go to sleep at night. I tried to instill in them a sense of pride and responsibility so that when they reach maturity and are entitled to vote, they don’t waste their right to make a difference. I may not reside in Nicaragua, but I am proud to be Nicaraguan. I try to help them in the ways that I can, by creating awareness in sharing this story. I have formed a Facebook group called, “Nicaragua in Exile” and we have about a few thousand members and growing. We come together for a single cause, to denounce this repressive regime. If you are reading this and would like to be part of our group, I invite you to join. What is happening in my country is not an isolated event. It is not just an issue against Nicaraguans, but against humanity. Every day I remind myself of my good fortune to have had Canada open her doors. Every day I make a point to acknowledge that my life was spared for a reason. Perhaps for you to read and learn from my story. what an incredible story. I can’t imagine the trauma. So fortunate to live in a country not ravaged by war. Thank you for sharing . I’m reading your blogs and they are so beautiful written, happy you have the strength and independence to move on and be happy. You have turned things around with such positive energy and strength. I was thinking about you for long time and definitely the universe reconnect us again. I wish you nothing but the best. Wow, Waleuska. What a story you have and you shared to eloquently. I too am a survivor of war, and even though I was too young to actually understand what was happening, the remnants are still within me, and affecting me now. It is something I am continually working on, and releasing. Yes, I’m sure there was a reason your life was spared. You are here now to bring awareness of the circumstances of your fellow countrymen. You are here for peace, which we all long for so desperately, and we are so blessed to have found it in our beautiful, free, welcoming, country of Canada. Lovely to hear from you gosh that was a tear jerking blog written so eloquently. I feel supercharged after the week long Dr Joe advanced would totally recommend it. Waleuska, may I share your story with my friends and family on Facebook? It is one that we all need to hear. Thank you for your strength, love and courage, dear lad.